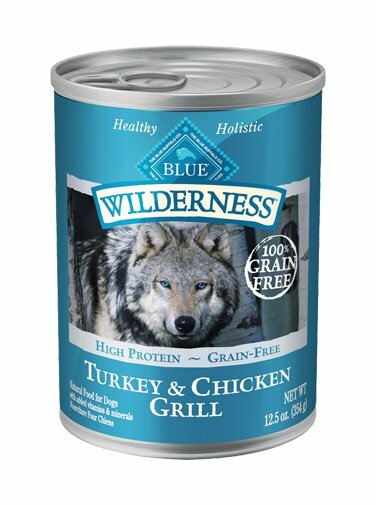 Inspired by the diet of the wolf, BLUE Wilderness is a high-protein, low-carbohydrate food that will provide your dog with a higher concentration of the turkey and chicken he loves. BLUE Wilderness is made with the finest natural ingredients, including generous amounts of tasty and nutritious turkey and chicken. And Wilderness contains no chicken or poultry by-product meals, artificial preservatives, corn, wheat or soy. Complete and balanced, BLUE Wilderness is also a sensible alternative to less convenient raw diets, which often require additional supplementation to be nutritionally complete. BLUE Wilderness canned food. Your dog will thrive on it. Turkey, Chicken, Chicken Broth, Turkey Liver, Potatoes, Flaxseed (source of Omega 3 and 6 Fatty Acids), Guar Gum, Carrageenan, Cassia Gum, Salt, Potassium Chloride, Glucosamine Hydrochloride, Zinc Amino Acid Chelate, Iron Amino Acid Chelate, Choline Chloride, Vitamin E Supplement, Copper Amino Acid Chelate, Manganese Amino Acid Chelate, Sodium Selenite, Thiamine Mononitrate (Vitamin B1), Cobalt Amino Acid Chelate, Niacin Supplement (Vitamin B3), Calcium Pantothenate (Vitamin B5), Vitamin A Supplement, Riboflavin Supplement (Vitamin B2), Biotin (Vitamin B7), Vitamin B12 Supplement, Potassium Iodide, Pyridoxine Hydrochloride (Vitamin B6), Vitamin D3 Supplement, Folic Acid (Vitamin B9).